Today I was tasked with determining the implications that pursuing LEED for Neighborhood Development (LEED-ND) certification would have on current, preliminary plans for a roughly 100 acre mixed use development including a retail center, offices, and a mix of single- and multi-family residential. Though generally aware of LEED-ND this is the first time I've tried to apply the rating system to a specific project, and I figured many of you will be in the same boat sooner or later. With that in mind, here's what has jumped out at me as the major issues we'll need to discuss with the client. If you have absolutely no idea what LEED-ND is or what it attempts to do, I strongly recommend checking out this short video before continuing. 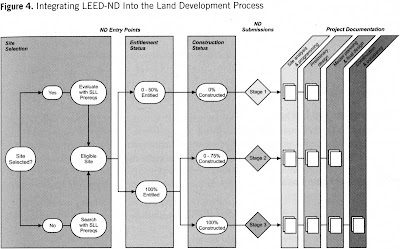 To create this analysis and resulting post I've been relying on the rating system document, the LEED-ND Reference Guide, and the nine page LEED-ND Certification FAQ. I would strongly suggest reading the "Introduction" and "Getting Started" sections in the reference guide and the FAQ as they contain a gold mine of administrative issues that you'll want to know about at some point. I'm hitting the high points in this post, but there's a great deal more info that you'll want to at least skim so you don't run into any nasty surprises. If you're not aware already, it's nearly impossible to pursue LEED certification without purchasing the appropriate reference guide for it. 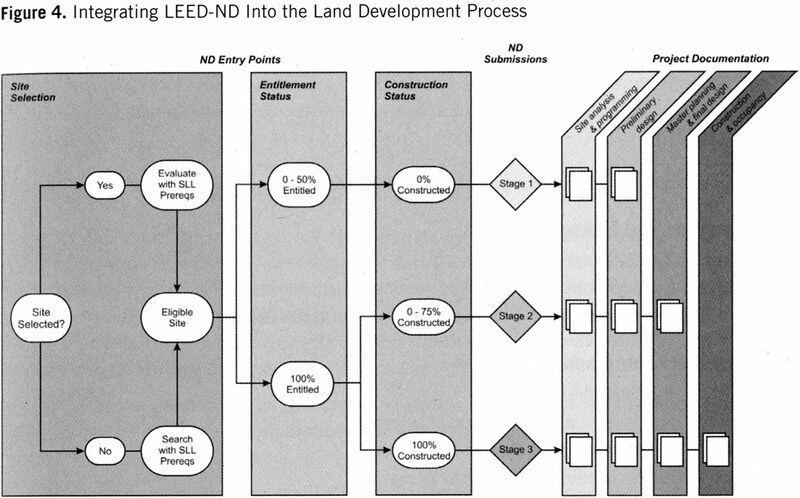 Unlike most LEED rating systems, LEED-ND uses a three phase review system, though depending on where you are in the planning stage you may not need all three. Each review follows the same format as the commercial LEED rating systems (i.e. submit review, receive preliminary comments from GBCI, amend as necessary and resubmit, receive final comments from GBCI, and appeal or accept the rating as granted). This review is designed to "help the developer build a case for entitlement among land-use planning authorities, as well as attract financing and occupant communities", and can only be pursued if "no more than 50% of the project's total new and/or renovated building square footage has land-use entitlements... for the specific types and quantities of... land uses proposed." According to the rating system language, entitlements are defined as "the existing or granted right to use property for specific types and quantities of residential and nonresidential land uses." I read this a "zoning is in place". Confused? So was I at first, but basically all this is saying is that if zoning is already in place for more than 50% of your total project as it will ultimately be built, you skip Stage 1 and move to Stage 2. Their definition of entitlements is based on planned building area, not land area. So even though I may have 75 acres out of 100 zoned how I want, if over 50% of my building square footage is in those last 25 acres (perhaps the neighborhood core?) then I'm still eligible for Stage 1. If zoning is not in place for 50% of the total square footage of the project, you may pursue this certification, but you're not required to. The impression I get reading through the guide is that the only people who should pursue a Stage 1 review are those developers who need help convincing local boards or zoning administrators that their plans are indeed sustainable and could benefit from a USGBC seal of approval of said plans. You can't proceed with Stage 2 until 100% of the entitlements are in place (i.e. finish up your zoning then move on). So now you have that in place and all of your design work is completed, but it's going to be quite some time before this place is completely built out... This is the time to submit for Stage 2 Pre-certification! Similar to the goal of Stage 1, the intent of pre-certification is to aid the developer in marketing, except this time to potential tenants and not zoning boards. Since many projects have long timelines for development, it's likely that more than a few will pursue Stage 2 pre-certification and stop there. One developer who participated in the pilot project system with a 25 year development timeline indicated that this is a likely outcome for them. This stage is the real deal, and once you reach it you finally have a certified project and a plaque to put somewhere. One question I have is that based on the information provided in the reference guide and other supporting documents, it's not clear whether a well prepared Stage 1 or Stage 2 documentation set would look much different than what's provided for Stage 3. Multiple sections of these documents suggest that more information and guidance on the matter is provided on LEED-Online, but at the moment I don't have access to that info. I've sent inquiries to the USGBC on this matter and will update this post when I hear back. As mentioned in an earlier post, LEED-ND fees aren't exactly cheap, but when you start to divide the cost over every building it starts to look much more favorable compared to certifying each building independently. For the 100 acre project I'm examining the total direct certification fees paid to GBCI (i.e. not including consultant costs) for one stage would be $1,500 registration + $18,000 for the first 20 acres + $350 * 80 additional acres = $47,500. That sounds steep, but when you consider that the cachet of LEED will fall upon the 334 buildings (34 commercial + 300 residential) within this area, likely a significant marketing bonus for all properties, that breaks down to only $142/building. If two stages are pursued (in this instance Stage 2 and Stage 3 are most likely), the total fees rise to $85,500 for both, or $255/building. When I wrote the previous post I was under the impression that a project was forced to seek all three stages of certification at considerable cost, but looking into the matter further it appears that a project may only need to complete one or two stages and can save significantly. I'm not 100% clear on this and have sent a request to the USGBC for clarification and will update this post when I have confirmation. It's important to note though that at least one building must achieve LEED certification of some form in order to satisfy a prerequisite, and additional points may be earned for additional certifications under the Green Infrastructure and Buildings category. Far more than any other LEED rating system, a good civil engineer or formal planner, ideally with a fair amount of GIS mapping experience, is critical to making the LEED-ND certification efforts proceed smoothly. You will be creating a LOT of site and vicinity maps to comply with Smart Location and Linkage and Neighborhood Pattern and Design prerequisites and credits. I admit that a layperson could likely handle most of this, but it will be very time consuming without a working knowledge of GIS software. One of the Green Infrastructure and Buildings prerequisites requires that all commercial buildings be designed to exceed ASHRAE 90.1-2007 (by 10% for new buildings or 5% for renovations) or smaller structures can meet detailed prescriptive requirements. Residential buildings must comply with Energy Star ratings. All projects must certain plumbing efficiency requirements. For this reason, it's likely that an MEP engineer will need to be involved in the documentation process as well, but not to the same extent as the single building LEED systems. A developer who handles most of the design in-house can probably survive certification without needing an additional consultant, but if they don't have some of the skills mentioned above it will be a very frustrating process. Alternatively, an architecture or planning firm could also provide a great deal of the documentation for a developer. At the end of the day it will come down to who can do the paperwork most efficiently, and in my opinion that is almost always the person handling the design the first place. Unlike other LEED systems where the prerequisites can generally be achieved on any site, it's very likely that it will be impossible to certify greenfield, surburban sites if there's very little or poorly connected infrastructure. The project I was tasked with examining will very likely not qualify for certification due to the fact that the neighboring sites are not very dense and it's bordering undeveloped parcels for much of the site boundary. Internally, the developer must be willing to commit to certain density requirements and also pursue a very urban style infrastructure with building frontages bordering streets instead of vast arrays of parking. For your convenience, I've briefly summarized the most critical prerequisites below so you can check to see if your plan will qualify. There are other prerequisites to consider, but these are the ones you need to know about before you pay a registration fee... For more detailed descriptions of the credits, download a pdf copy of the rating system itself. SLLp1: Smart Location - This is the one that will prohibit greenfield, urban fringe projects from qualifying. The site must be currently served by water and wastewater service or "within a legally publicly planned water and wastewater service". In addition to that requirement the project must be an infill site (see credit for details, but it's pretty much what you'd expect), OR at least 25% of the project boundary must be immediately adjacent previously developed property while land within a 1/2 mile radius contain an average of 90 intersections/square mile. Confused? Even the free rating system pdf has good maps clarifying the credit. SLLp3: Wetland and Water Body Conservation - Want to fill in some wetlands on the site? Not going to happen... It's going to be very difficult even building within 50 feet of wetlands or 100 feet of water bodies (beyond minor improvements like paths), which is prohibited unless you meet stringent stormwater management and density requirements. SLLp4: Agricultural Land Conservation - There are significant restrictions to building on land "within a state or locally designated agricultural preservation district". SLLp5: Floodplain Avoidance - If your site is within a 100-year floodplain, it better be an infill project or previously developed, otherwise you're not going to be able to build there at all. NPDp1: Walkable Streets - Technically you don't need to know this prior to design starting, but the developer should probably be warned as these will significantly shape their project. 90% of all new building facades must directly border "public space, such as a street, park, paseo, or plaza, but not a parking lot, and is connected to sidewalks..." Additionally, sidewalks must be provided on both sides of 90% of internal streets or frontage, and no more than 20% of street frontages can be faced by a garage door. There are also street width to building height ratios that must be followed for at least 15% of the development. NPDp2: Compact Development - For projects located within walking distance of a transit corridor, you must build to a minimum density of 12 units/acre residential and .80 FAR for commercial spaces. Projects not within walking distance of a transit stop must build to a minimum 7 units/acre residential and .5 FAR for commercial. NPDp3: Connected and Open Community - Internal streets within a project must average at least 140 intersections/square mile and there must be "at least one through-street and/or nonmotorized right-of-way intersecting or terminating at the project boundary at least 800 feet." No one way in, one way out developments here! This category has three prerequisites, but they are all to be tackled much later into the design process. Basically you have to have at least one LEED certified building within the LEED-ND project, and all buildings in the development must meet minimum energy and water efficiency requirements. It's important to note that this is my first review of these credit requirements, and though I work to ensure this blog is as accurate as possible, I shortened many complex credit requirements down to only hit the big spots. I may have also overlooked small details that would provide exceptions to the statements below. This post is intended to get someone who hasn't cracked the book up to speed about LEED-ND as quickly as possible, but it's ultimately up to you to read the reference guide and meet all of the requirements. Please call out any mistakes or differing opinions in the comments and I'll update the post ASAP. i have to admit, i'm mighty confused by the image of the anti-welcome matt in the article. if the intent was to grab readers' attention, it succeeded... but to the detriment of the article. one of my struggles with LEED-ND is the fundamental targeting of a middle- to upper-middle-class, predominantly caucasian design ethos. the juxtaposition of the anti-welcome matt regarding gentrification is confusing to me. are you criticizing LEED-ND? are you in favor of the concept of gentrification? I've always tried to balance providing accurate, useful information with a mix of light-hearted jokes and images to keep everyone from pulling their hair out from boredom. I have my own sense of humor, which people often don't share. I wasn't trying to make a statement with the image or anything like that... I simply read the Onion and found that doormat funny. In any case, I think you're correct that in this instance the image originally featured on the post, provided without explanation, detracts from the post far more than it makes it interesting. As a result, I've swapped it out with something far more innocuous, and I appreciate you taking the time to comment. Stages 1 and 2 are in fact "optional". However, only stage 3 results in a LEED-ND Certification. If a project successfully pursues an earlier stage, it must proceed to the next stage within a certain time frame in order to leverage the information provided at the earlier stage. Depending on the credit, documentation can be very similar between stages or it can be completely different. Where possible, we've tried to align the requirements between stages. In some cases, no additional documentation is needed in the next stage if there is no change in the design and the credit was successfully achieved (i.e., in Stage 3, you would simply indicate that nothing has changed and that you achieved the credit in Stage 2). I would add that one of the major benefits of the earlier stages is to help determine whether the project is on the right track. Given the complexity of the LEED-ND rating system (and the complexity inherent in development projects), we encourage project teams to begin the LEED-ND certification process early.